JULES Hamburgers. The cornerstone of any nutritious breakfast. What kinda hamburgers? JULES No, I mean where did you get’em? MacDonald’s, Wendy’s, Jack-in-the-Box, where? JULES Big Kahuna Burger. That’s that Hawaiian burger joint. I heard they got some tasty burgers. I ain’t never had one myself, how are they? JULES Mind if I try one of yours? JULES Yours is this one, right? JULES Uuummmm, that’s a tasty burger. (to Vincent) Vince, you ever try a Big Kahuna Burger? 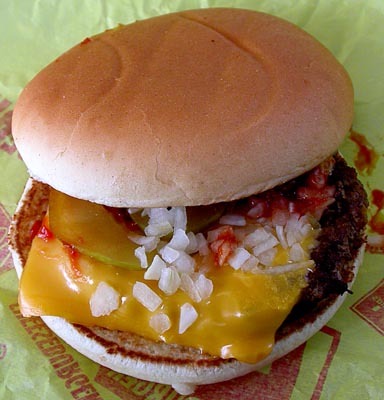 Okay, so why the photo of the McDonald’s cheeseburger? Well, it was my lunch but there’s another reason too which I can’t say at this time. But suffice to say that it’s your pretty standard run of the mill cheeseburger, not a Kahuna Burger and it was my late lunch on Saturday. Sorry if the photo grosses you out, maybe it’s supposed to so you won’t eat one. Saturday, my Monday since I’m off on Thursday and Friday, had me shooting the rodeo and a track meet. I only pretty much shot photos for the newspaper at those two things so no POTD from those assignments. Better luck tomorrow.